It wasn’t so long ago that monochromatic kitchens were replaced by two-color kitchens. Homeowners embraced the idea of kitchens with two shades of cabinets or islands in a complementary hue, and trade pros were happy to make it happen. The newest kitchen trend is even more exciting because it incorporates three cabinet colors into a single, cohesive space. The result is a beautiful, layered effect — and pulling it off, from a contractor and homeowner perspective, is easier than you think. Contrasting colors differ in lightness and darkness. Light green, for example, contrasts with dark green. The degree of contrast between the colors is simply a matter of personal taste. Homeowners, in collaboration with designers, may find that combining light blue upper cabinets with medium blue lower cabinets and a dark blue island creates a colorful appeal without feeling busy or overwhelming. This same approach can be done with kitchen cabinets and flooring combinations. Analogous colors involve hues that are side by side on the color wheel. Such colors (think blues next to greens) are frequently found in nature, making them pleasing to the eye. Ideally, one color is selected as the focus, a second is used to support it, and a third is applied as an accent. A split-complementary color scheme intentionally incorporates three different colors. Complementary colors are those that are opposite of one another on a color wheel. Split-complementary schemes feature one base color and two complementary colors that are analogous to each another (a blue base, for example, with orange and yellow complements). Triadic color schemes, perhaps the most vibrant of combinations, utilize three colors that are evenly spaced around the color wheel: red, yellow, and blue, for example. As with the split-complementary scheme, it makes design sense to choose one of the three colors to use most prominently and add the other two hues on a smaller scale. Trade pros know (and happy homeowners can agree) that creating a kitchen color scheme is an easy, effective way to personalize a space. Kymberlyn Lacy is the principal interior designer for International Flair Designs in Little Rock, Arkansas. Lacy encourages the use of multiple colors in a kitchen — via cabinets in particular. “Infuse your cabinets with bold neutrals, such as navy or gray,” she says. “Create interest by selecting contrasting or complementary colors and add personality and pizzazz to your overall kitchen design." The most popular two-toned kitchens feature an island in a color that complements or contrasts the rest of the cabinets; another way to establish a two-toned look is by painting upper and lower kitchen cabinets different colors. An island with a different wood finish or paint color feels more like furniture than cabinetry, giving the kitchen a custom look. Taking the kitchen from two colors to three is easy: One color is featured on the upper cabinets, a second on the lower cabinets, and a third on the island or woodwork. And that “color” doesn’t always involve paint. Modern kitchens intermix a variety of wood tones, so rest assured that it's not unheard of (and is even encouraged!) to go after kitchens with two different color cabinets. And mixing wood is not the design faux pas it used to be. In fact, wood that’s all matched is now considered dated. Today’s fashionable kitchen might boast medium lower cabinets, lighter upper cabinets, and a rich, dark island — all different shades of brown wood tones. You can then take these ideas and move them into other rooms of the house. After all, cabinets aren’t just confined to the kitchen: the living room, mudroom, bathroom, and more can be spruced up with a three-color cabinet scheme. 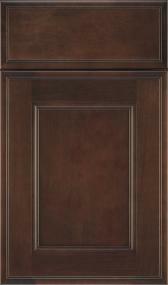 Review inspirational images for three-toned kitchens (or other rooms) and the online product catalog for cabinets. If you're a homeowner, add what you like to the myProSource Project Center, then discuss it with your ProSource Wholesale trade professional member to move forward on your renovation. If you're a trade pro working with clients who are ready to tackle their kitchen design color schemes, share what you've learned with them. Keeping up with the latest trends is fun, but the ultimate goal is to create a kitchen that’s livable. Whether you achieve that look with one, two, or several colors is entirely up to you.